Rather empty on a recent Saturday night visit. A ''singer'' with a music machine was entertaining nobody in particular. Two real ales available. Both in reasonable condition. Neston pubs seem to be slowly dying. The only one which was full was the Elephant Bar but it is not listed on BITE. A friendly, comfortable pub, far more pleasant inside than the rather austere exterior suggests. I paid my first ever visit on a weekday lunchtime and relaxed in a leather armchair with a pretty decent pint of Black Sheep. Former hairy old armpit of a pub now shaved and deodourised for the better! Had Youngs and Courage beers on when I went which were in good enough nick but much too cold. Was less than impressed with the �2.70 a pint pricing. Nicely decorated. Selection of beers including real ale. Often a singer at weekend. One of the better Neston pubs. 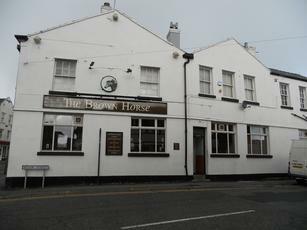 The Brown Horse in Neston has changed radically under it's current management.Terri (the licensee) and her friendly staff serve an extensive variety of beers (including real cask ale which is regularly rotated) along with wines and spirits galore! Food is available (either meals or snacks) for most of the day. Most saturdays and some fridays the Brown Horse features live music. A great, friendly pub. Well worth a try!